Chris Robinson catches up with IBF welterweight champion Shawn Porter (23-0-1, 14 KO’s) in Las Vegas at the Silverton Casino as he shares his thoughts on the recently-discussed matchup between Floyd Mayweather and Amir Khan that may be taking place later this year. 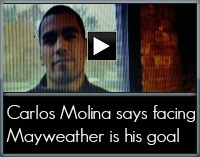 Click on the thumbnail for more of Porter’s thoughts on this fight. Chris Robinson catches up with boxing legend Roy Jones Jr. (57-8, 40 KO’s) in Big Bear, Calif. as he opens up on Anderson Silva’s upset loss to Chris Weidman, a possible fight with heavyweight contender Tyson Fury, his desire to keep fighting, and more. Chris Robinson interviews light heavyweight prospect Eleider Alvarez (13-0, 8 KO’s) for 18 minutes in Big Bear, CA during his training camp for his match vs. Thomas Oosthuizen on January 18 in Montreal, Canada. Click on the thumbnail for Alvarez’s thoughts on his upbringing in Columbia, his foray into boxing, his move to Canada, his other passions in life, his bond with his stable mate Jean Pascal, and much more. Chris Robinson catches up with the great Roy Jones Jr. in Big Bear, Calif. as he speaks on joining Jean Pascal’s camp ahead of his Jan. 18 HBO bout vs. Lucian Bute. 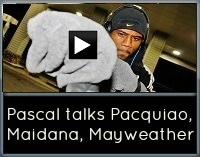 Click on the thumbnail for Jones’ thoughts on his bond with Pascal, what he’s trying to teach him, and how they can defeat Bute. Sources close to the information have informed HustleBoss.com that former three-division champion Abner Mares has suffered an injury while in training that has subsequently seen his rematch with Jhonny Gonzalez pushed back to March 15th from the original date of February 15th. 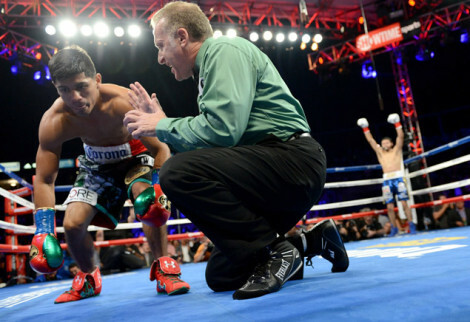 Mares was training for the rematch in Mexico City but our source claims that he suffered a rib injury during training. Gonzalez pulled off one of the year’s biggest upsets last August when he stopped the heavily-favored Mares in one round. 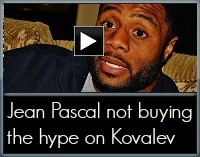 Chris Robinson catches up with former WBC light heavyweight champion Jean Pascal amidst his Big Bear training camp ahead of his upcoming clash with Lucian Bute. If the June 7th Sergio Martinez vs. Miguel Cotto fight pushes through, there may be some interesting subplots to follow. Turns out that Martinez has some bad blood towards Cotto over an incident that took place in 2008. Chris Robinson catches up with North Philadelphia’s Naazim Richardson, as the trainer speaks on his praise towards junior welterweight champion Danny Garcia and WBO welterweight titlist Tim Bradley. Chris Robinson catches up with WBA middleweight champion Gennady Golovkin (28-0, 25 KO’s) inside of the Summit Gym in Big Bear, Calif. following another tough workout. As seen in updates to her personal Instagram account, pop superstar Rihanna continues to enjoy the holiday season, as she has been showing off several bikini photos of herself during her latest vacation in Barbados. Hit up the thumbnail to access the images. Chris Robinson catches up with featherweight prospect Juan Funez (3-0, 1 KO) inside of the Summit Gym in Big Bear, Calif. following some tough sparring with Alex Miskirtchian. Click on the thumbnail to hear what Funez had to say about the work, his upcoming debut on ESPN on Jan. 24, working with his Uncle Ricky, his time sparring at the Robert Garcia Boxing Academy, and much more. Chris Robinson catches up with strength and conditioning coach Angel Heredia in Big Bear, Calif. following a workout for his fighter Jean Pascal ahead of his Jan. 18 meeting with Lucian Bute. 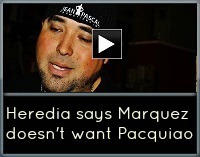 Click on the thumbnail to hear Heredia speak on another one of his clients, Juan Manuel Marquez, and what his future may hold. As seen in updates to his Instagram account, comedian Kevin Hart has been spending the past few days vacationing in the Caribbean in the territory of Anguilla with artist Ludacris, IndyCar racer Marco Andretti, and their girlfriends. Click on the thumbnail for a closer look at all the action in the Caribbean. 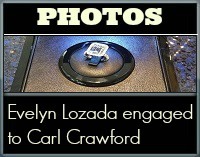 As evidenced in photos posted to her personal Instagram, reality star Evelyn Lozada has confirmed that she is indeed engaged to Los Angeles Dodgers star Carl Crawford.